The DPP is looking for LGBTQ+ Parents and Prospective Parents with Disabilities! It’s Pride Month, and we are celebrating! Enter a chance to win a $50 Amazon® Gift Card by writing for the Disabled Parenting Project (DPP) blog. 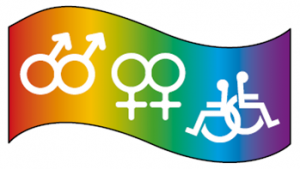 The DPP is seeking guest blogs written by LGBTQ+ parents and prospective parents with disabilities on sexual orientation and parenting with a disability. These blogs can be from disabled parents as well as people with disabilities considering parenthood. For each blog submitted, guest bloggers will be entered into a lottery. Contestants can increase their chances by submitting more than one blog! Guest blog entries must be submitted to the DPP via email (info@disabledparenting.com) by June 22nd at 11:59pm EST. Each blog submission must include at least one photo and comply with the DPP blogger guidelines. Contest is only open to people living in the United States. Blog entries submitted after the deadline will not be included in the lottery. For more information, please email the DPP.